The proposal by Brazil, Colombia and Ecuador to include manta ray species on Appendix II was adopted at the 16th CITES Conference of the Parties in Bangkok! The results of the Committee vote on Tuesday, which was conducted by secret ballot, was 96 votes in favour, 23 against and 7 abstentions, well over the two-thirds majority required for the proposal to be adopted. Today this vote was confirmed in the final plenary session of the conference with no objections from any of the Parties. This CITES Appendix II listing means that international trade in manta rays or their parts will no longer be permitted unless the exporting country can provide evidence that they are from legal and sustainable fisheries that do not threaten manta ray populations. By signing this petition, you and all of the more than 33.500 signers made an important contribution to this very important victory for the conservation of manta rays. Manta rays are world renowned for their charismatic beauty, gentle behaviour, and inquisitive, playful nature. For this reason, tourists spend nearly US $140 million annually to see these manta rays in the wild providing an important source of income to many countries. In the last decade, a market has emerged in Asia for ray gill plates as a tonic, which has no basis in official Traditional Chinese Medicine and no proven health benefits. Thousands of manta rays are being killed each year. CITES (the Convention on International Trade in Endangered Species of Wild Fauna and Flora) is a binding international agreement between governments. 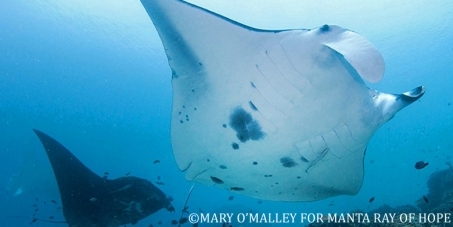 We ask that during the next CITES meeting in March 2013 countries vote to list manta rays under Appendix II of CITES. Please sign and share this urgent petition and help us to gain protection for these amazing animals.